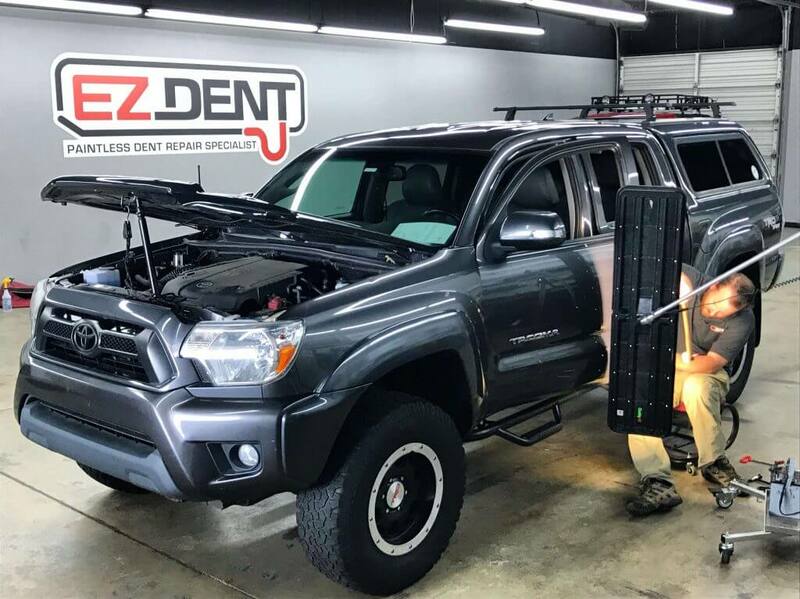 From Corollas to Land Cruisers, EZ Dent has experience fixing bends, dents, irregularities, and dings on the bodies of all models of Toyota cars and trucks. Best of all, our process, paintless dent repair (PDR), is fast, inexpensive, and effective. We are based in Athens, GA and serve all of North Georgia with Toyota dent repair & removal. PDR works by slowly massaging the metal back to its original glory using specially designed tools. Unlike a traditional body shop, we do not use putties, resins or chemicals. When your Camry, Prius, or other Toyota vehicle gets a dent, you typically want to know how much it will cost. Compared to going to a body shop, PDR is much more affordable. We can bill any insurance company, but the repairs are usually less than your deductible. Once we see your vehicle, we can advise you on whether you should involve your insurance. There are several factors that go into the price of dent repairs, including the location of the dent, your car’s make/model/year, and the type of dent. But, we are able to offer better service than body shops since dents are our sole focus. We have developed an efficient and cost-effective process to get the job done quickly and correctly. *Disclaimer – EZ Dent is not affiliated with Toyota or authorized Toyota dealerships. We enjoy serving Athens, Atlanta, and all of North Georgia with dent repair and removal for all colors, body types, and models of Toyota vehicles, including the RAV4, 86, 4Runner, and Yaris. For a free quote, contact us today. Read Our Google Local Reviews! Read even more from around the Web!